I was going to photograph every day and post one picture a day. My goal was to improve my seeing and editing and hopefully post photographs that interest others. The idea of doing this comes from the International Center of Photography old course of shooting a roll a day and critiquing once a week, a course I could not do with my day job. In the October Shutterbug, Joe Farace proposed readers do a photo-a-day blog and gave 4 web sites as examples. So I started this project on my web site as a daily blog with high hopes for it. Unfortunately, I had to stop. It is now July, 2014, and I have resumed this project. I really welcome any comments any viewers will send me on this gallery and on any of the others as well. Rockefeller State Park in New York on an overcast dreary Labor Day, 2012, was just the place for a walk in the woods around this lake. 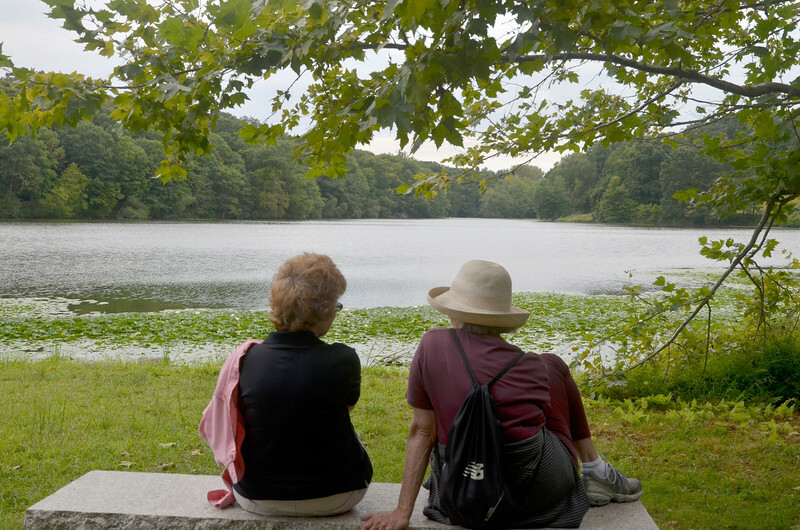 These two ladies were viewing the lake and the white water lilies in full bloom and chatting.